August is the beginning of Druid autumn, I found out several years ago when telling a friend that I feel mournful in August, even though it’s still summer. Learning that the Druids considered August the beginning of autumn resonated with me, and gave me a place for my sadness this time of year. It’s now September, and the physical signs of change are showing. 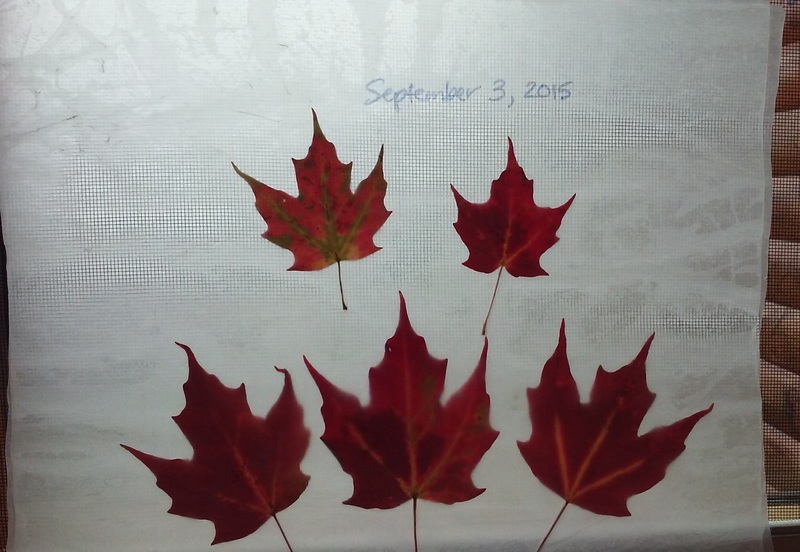 Red and yellow veined green leaves began spotting the road under the maples about a week ago. Some are fully red now, and although a harbinger of the coming cold season, they are so pretty. I picked up several of my favorites, and as my mother showed me when I was little, I placed them between sheets of waxed paper and ironed them together. I put a rag underneath and on top of the waxed paper, and kept checking to make sure it was working. My S.O. wasn’t all that impressed when I showed him later, but its a simple craft helping me ease into autumn. I’m sure I could have created something more sophisticated, but I also enjoyed its childhood link. I suppose we could dry the tomatoes, freeze some of the corn, carrots, and green beans, as well as what we’re doing, which is making as many recipes possible with all the fresh food. It’s also nice to know where and how our food was grown, and I feel more connected to our land than before I started gardening. The cooler breezes are more welcome than the humid dog days we’re leaving behind, and sleep is more restful with cooler air too. I’m not ready to give up summer, and wish it lasted at least another month, but I’ll savor all the warm days ahead, and do my best to accept rather than resist – or figure out how to move to warmer climes! I grieve in the morning, before I’m fully awake, the weight of things done and undone open to attack. I’m as undressed in my psyche as I am on my body, and it takes my beginning routine to shake it off. Make the bed, start coffee – unsettling thoughts crowd my mind while thinking about the day ahead. Dreams can be the impetus for the unwelcome feelings as I recall specters of children I might have had, old friends and new, and a parade of strangers helping or hurting. I had a baby in last night’s dream. She was beautiful, but I couldn’t get to her, I had so much else to do in preparation. My purpose is the baby, I think, dying from neglect, while I’m desperate to get to her. Perhaps she is my core self, the unblemished bit of me needing attention. The dream doesn’t account for the weight I’m shouldering, and then I remembered how I shared some of my story to help an interviewer understand the needs of those abused, how we pay even in the telling, but how necessary the sharing is for change and healing. The cool breeze and shade diminished the heat of the sun as I walked down the road to Marie’s house. I watched the big maples and oaks as I walked, their leaves rippling and swaying in the wind, the sun filtering through them creating dappled patterns, moving kaleidoscope-like on the pavement. I tried leaping into spots of sun but the dance was too fast, I kept losing the game. The rustle of chipmunks and squirrels startled me as much as I startled them, leaving me relieved to see them scampering under the leaf cover, over a log, or up a tree. When the woods got thicker, the sun spots all but disappearing from the road, I worried about hungry bears and wolves attacking me, and I’d quicken my pace, but never run. Running was cowardly, and the rule was, I’d only run if I actually saw a bear or wolf, otherwise, I just had to feel the fear, knowing that it wouldn’t be far until the trees thinned out, giving way to the fields, where I’d be back under the hot sun, hoping the breeze kept up. Some days, when there was no breeze, I’d pretend I was lost in the desert, the shimmer of heat up from the pavement was a mirage – that wasn’t Marie’s house up ahead, really. It would disappear when I got closer, my parched lips, dry mouth, and swollen tongue would find no respite. The game ended when I reached her driveway, and sometimes she would be outside waiting for me, and then we’d go off, away from her nosy little brothers, and play games with her Barbie and Ken doll – marrying them and then making them get divorced for various reasons. The hottest days, when she was inside, I’d revel in the cooler inside air, going over the kitchen sink, helping myself to a long drink of water – rescuing the poor desert wanderer. My parents had divorced about two years then, and I liked being at Marie’s house where her mother and father were together, and they lived a life as normal as I wish I had. © seekingsearchingmeaning (aka Hermionejh) and Abstractly Distracted’s Blog, 2010 – current. Cults abound. I grew up in one, and the apologists continue trying to convince more reasonable people of the cultists’ righteousness, that they have the answer(s), and you should give them all your money and worldly possessions in pursuit of oneness with their cult leader – because you can be damn sure there is a hierarchy, and they get the best of the best. That’s why it’s a cult – or the politically correct assignment of ‘high-demand group’. I don’t understand the more pleasant moniker, I suppose it seeks to lessen shame. There are so many incarnations (pun intended?) of cults, it’s hard to know whether you’re dealing with one. Here are a few handy tips, taken from Janja Lalich & Madeleine Tobias’s work: Take Back Your Life: Recovering from Cults and Abusive Relationships by Janja Lalich and Madeleine Tobias (Berkeley: Bay Tree Publishing, 2006). It is adapted from a checklist originally developed by Michael Langone. Janja Lalich, Ph.D. & Michael D. Langone, Ph.D. Concerted efforts at influence and control lie at the core of cultic groups, programs, and relationships. Many members, former members, and supporters of cults are not fully aware of the extent to which members may have been manipulated, exploited, even abused. The following list of social-structural, social-psychological, and interpersonal behavioral patterns commonly found in cultic environments may be helpful in assessing a particular group or relationship. Compare these patterns to the situation you were in (or in which you, a family member, or friend is currently involved). This list may help you determine if there is cause for concern. Bear in mind that this list is not meant to be a “cult scale” or a definitive checklist to determine if a specific group is a cult. This is not so much a diagnostic instrument as it is an analytical tool. ‪ The group displays excessively zealous and unquestioning commitment to its leader and (whether he is alive or dead) regards his belief system, ideology, and practices as the Truth, as law. ‪ The leadership dictates, sometimes in great detail, how members should think, act, and feel (for example, members must get permission to date, change jobs, marry – or leaders prescribe what types of clothes to wear, where to live, whether or not to have children, how to discipline children, and so forth). ‪ The group is elitist, claiming a special, exalted status for itself, its leader(s) and members (for example, the leader is considered the Messiah, a special being, an avatar – or the group and/or the leader is on a special mission to save humanity). ‪ The leadership induces feelings of shame and/or guilt in order to influence and/or control members. Often, this is done through peer pressure and subtle forms of persuasion. ‪ The group is preoccupied with bringing in new members. ‪ The group is preoccupied with making money. ‪ The most loyal members (the “true believers”) feel there can be no life outside the context of the group. They believe there is no other way to be, and often fear reprisals to themselves or others if they leave (or even consider leaving) the group. Not all of these need to be present for the cult classification, and apologists for cults will read the list, discounting what they read as ‘not entirely applying’, thereby allowing them to justify their beliefs about their group not being a cult. It took a lot of work to de-program myself, especially when people like my mother still value their experience there. I ended most of my relationships with ex-culters, and try to only communicate with those de-programmed, or non-apologists. Several peers with whom I survived the cult continue reinforcing old cultisms such as believing the best, most positive, most understanding people were from their time there, when the reality is that bonds formed in childhood and young adulthood gain stature as time passes because you are known more completely than others recently met, such as co-workers, or casual friends. The deep friendships I made outside the cult revealed how damaging that place was, because we forged lasting, trusting connections, while acquaintances, and co-workers, currently, and through the years, often increased my sense of isolation rather than connection. Had I not made those honest and abiding friendships, I too, might believe that the cultists were right, and we were a special group, designated by god. It’s also the ultimate egomania to believe that you were, or are, ‘chosen’, or accepted into such lofty ranks, above all on earth but those who worship or live as you do. I’m grateful to have claimed back my autonomy, my power, and my voice. My mother brines and dresses the turkey, cramming the cranberry and celery stuffing into the rinsed cavity, and then trussing the legs before placing the bird in the black and white speckled enamel roasting pan. Percolating coffee on the stove draws me near, and I perch on the kitchen stool next to the stove, watching as the hot water browns more with each eruption into the glass top of the percolator. I wish my mother would let me drink coffee, but she makes me a weak ‘tea’ out of cinnamon, and sugar in warmed water, with a splash of milk. She calls it Cambric Tea, although she substitutes cinnamon for tea. One of my older brothers is washing a mound of potatoes, carrots, and turnips, while my next oldest brother is on peeling duty. Never a turnip lover, I hate that she mixes them with the carrots, but at least she keeps the potatoes on their own. My sisters will do the mashing later, while my little brother and I squirm in our impatience, and our pleas of when dinner will be ready, is met with ‘every time you ask me that, it will take longer’, by my mother. Around 1 p.m., relatives begin arriving into the now steamy house. Most of my cousins are older and don’t pay my little brother and I much attention, but we always eavesdrop on their conversations until told to go away by our older siblings. Sometimes we get to play Monopoly, or, Life, with my cousins, although, Mouse Trap, is my favorite. My older brothers consider Mouse Trap a baby game, so usually my little brother and I play that on our own, or with my next oldest sister, but it turns out that, Mouse Trap, is the only game we have they don’t, so we play it several times. My aunts keep council with my mother in the kitchen, placing the desserts and sides they brought up on the refrigerator – and out of the reach of any hungry marauders, and then they set the main table, while enlisting me and my brother who made the mistake of coming into the kitchen, to set the card tables. My father and uncles arrange the card tables and the folding chairs they brought, and then retreat to the den for cocktails, while they smoke and watch football. There is nothing better to me than sitting on the kitchen stool and listening to the laughter and chatter of my mother and aunts. They fill an otherwise stressful and dreary house with fun and good cheer. Even my father is approachable as the relatives take his mind off of everyday life too. Once everything is ready and platters fill out the tables, my father comes in and carves up the turkey. Then the assembly line of passed plates circles the room until everyone has their dinner in front of them. My father intones the Thanks-giving prayer over our bowed heads, and then the happy moment of digging in begins. Dark meat is my favorite, drizzled with the turkey dripping gravy, a pool of which floats in the center of my mashed potatoes. I manage to feed our dog the carrot and turnip mash, even though she will throw most of it up later from so many helpings of rich food greedily chowed down. My mother’s cranberry relish is one of my favorite dishes. Most of the cranberries are ground up well, but an unmixed half a cranberry made it through the mixer, so tart I need a mouthful of potato, or a sip of milk to swallow it. Hot, buttered, rolls steam on the white cloth napkin in their straw basket, and we know that later on, after the adults have retired in the den for talk and more coffee, and we children have finished the dishes, dessert would finally be served. Pumpkin, Pecan, and Minced Meat pies, cinnamon rolls, and bread pudding with homemade whipped cream. Even though we are stuffed from dinner, we’ll find room for dessert! All too soon the relatives begin saying their goodbyes, and proceed out: our uncles and aunts, laden with the card tables, chairs, and extra dishes, followed by our cousins, start down the cement path, the chilled air swirling into the front hall, as my little brother and I call out tearful goodbyes, knowing a bath and bed are soon to follow. How many years has it been? Twenty-five, no, thirty! I’ve been going to the Down Home Agricultural County Fair since I was seven or eight, and now it’s canceled. 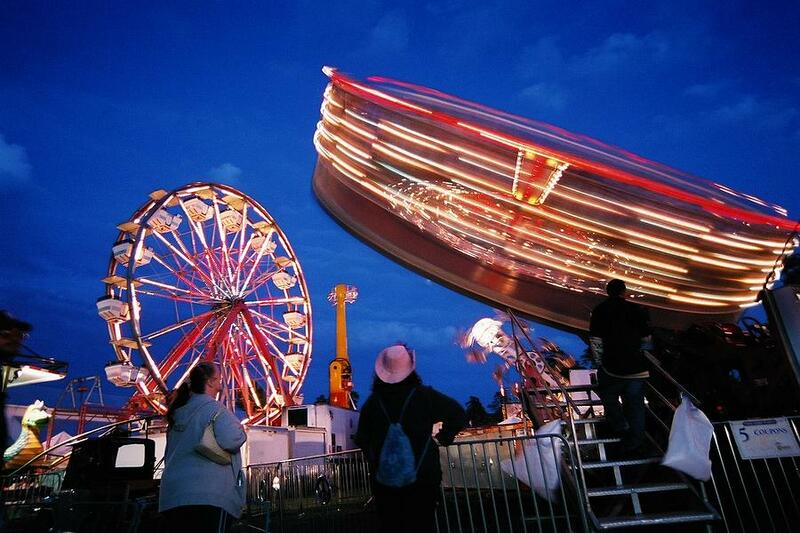 Sure, there are other fairs, I suppose – other fairs that are not the Down Home! I had my first kiss underneath the bleachers next to where Frank’s Fabulous Pigs raced. I had turned thirteen the previous September, and Jimmy Reynolds, my friend and secret crush since third grade, grabbed a hold of my hand and pulled me under the bleachers. At first I thought we were just going where we shouldn’t be, maybe to look for lost money, him beaming that ten-megawatt smile at me, and me awaiting further instruction, when he leaned in and kissed me. My heart pounded and my hands were instantly sweaty as I kissed him back, and we stood there until the sound of feet stomping above us broke the spell. We held hands the rest of the night, and although it was usually hard to shut me up, I couldn’t think of a thing to say – and neither could he. We just kept riding the rides, playing the carnival games, and sharing fried dough, and a fresh-squeezed lemonade. Jimmy moved to Florida at the end of the summer, and we wrote letters back and forth for a while, promising to visit, which we never managed, and after a year went by the letters slowed, and by the next summer, I stopped hoping for a response to my last few letters. The Down Home County Agricultural Fair was a near guarantee to see everyone I knew – and the chance to eat my fill of french fries with vinegar, fried dough, and over-priced lemonade, that I enjoyed watching the vendor make for me. “You like it sweet or tart, honey?” Sweet for me, tart for Jimmy. Time wore on, and every year the events that attracted me changed from thrill rides to animal shows, and after my son was born I went with friends who had children, and we’d meet year after year, first riding with our children on the kiddie rides, our knees scrunched up, or wider hips not quite fitting into the tot-sized cars, and when they were big enough, putting our children on the kiddie rides alone, and watching with happy trepidation as they thrilled or freaked-out, and when they were older, bidding them farewell with instructions to meet later by the front gate, and having them pretend they didn’t see us whenever they’d pass by. With my son in college, and friends scattered around, I went to the Down Home by myself last year, and spent most of my time looking at prize-winning quilts, home-made clothing, garden and preserve entrants’ displays, and shook my head at the carnies luring game players to win prizes not worth the two dollars to play one game. Back in my day, I find myself thinking, it was a quarter, and the prizes were bigger, and better quality too. I might as well start yelling at the kids to get off my lawn. I catch myself and laugh, I don’t want to be in the ‘old coot’ category – not now, not ever. Too Shy, that was my nickname for a while in fourth grade, only the bullies ran it together – Toozhyyyy – so it sounded like my parents named me from a science fiction or fantasy book, or that I was from some exotic locale, which was how I liked to think of it. I went to a new school a few weeks after fourth grade had already started, and made friends with Annabelle at recess my first day. She wanted me to join in a game of Red Rover, but I said I didn’t want to because I didn’t know anyone, and I wasn’t very good at it, and she declared my problem was being too shy, which Eddy Frost and Kyle Jacobson heard, and started calling me Toozhyyyy, looking at me with their stupid, sour, faces, as if they had made up the best insult ever. I guess, maybe they had, because that’s what everyone called me when the teachers weren’t making them use my name, which is Susan. Most of the time I pretended it didn’t bother me, but Annabelle suggested I bow the next time they called me it, and after that I became Queen Toozhyyyy, and one day I couldn’t take it anymore so I started calling Eddy, ‘Betty’, and Kyle, ‘Kyle-Pig-Pile’, and Annabelle laughed like it was the best joke she ever heard, and she called them that too, but it didn’t catch on. Eddy told me he was going to beat me up after school if I kept calling him Eddy-Betty, and I told him I’d stop when he and Kyle-Pig-Pile stopped, and I hoped he knew how to fight good because my older brothers taught me how to fight, and I’d sure hate to see the bloody nose he was going to have. I said it with my meanest look, staring right into his eyeballs as if I could see right into his bloody brains. Eddy and Kyle left me alone after that, and I’ve been Susan ever since. “Why can’t I go with Lisa and Trudy?”, I begged mom for the third time in twenty minutes. She was cutting up carrots, and celery – and she gave me and my little brother a half a celery stalk for a snack, before adding the rest into the pea mash in the big stew pot simmering on the stove. Mom stopped chopping and eyed me, her lips whiting around the edges. “Well, they are not your Mom, and your older brothers will take you after dinner, and if you don’t like it, you don’t have to go at all.” She wiped her hands on her blue and white-flowered apron before picking up the ham-hock and adding it into the pot. “And, it’s the first year your little brother is going Trick-or-Treating, and you’ll have to stay with him” She turned around starting to chop the onions, and I knew I’d be in trouble if I said another word, but I couldn’t help groaning, and I left the kitchen when I saw her raised eyebrows. I laid down on the couch in the other room to pout, and listened to the wind blowing leaves against the side of the house, and after a while mom began humming, and I could hear my brother playing with his Lincoln log set on the kitchen floor, the sounds making me sleepy. The celery hadn’t made me any less hungry, but mom would just get irritated again if I started asking if supper was done. I got up and went into the kitchen anyway, and sat at the rectangular Formica table with the bumpy metal trim I liked to run my fingers along. I didn’t like the kitchen chairs in the summer when my legs stuck to the plastic seat. My brother got his head stuck in between the chair top and seat last summer and mom buttered his ears to get his head back out. The stupid kid tried to do it again but mom warned him that she would just leave him there this time. I thought that sitting at the table would make supper get done sooner, but instead, it seemed to take longer. I liked the way the windows were steaming up though, and I went to draw a finger picture on the window but mom yelled at me that it would leave grease marks, so I sat back down and laid my face on the cool table-top. Mom told me to get up and get the bread out of the pantry and put it on a plate, and then get the bowls and spoons out. I didn’t grumble this time because I was so hungry and I knew that meant supper was ready! I even got the butter without being asked. Mom sat my brother on top of the phone books on his chair, and she told me to get my brothers and sisters for supper. I yelled from the bottom of the stairs, making my mom yell at me from the kitchen to walk upstairs and get them, but they were already stomping down. We all sat and ate our dinner, my older brothers finishing first, and my sisters close behind. I loved the soup so much I wanted another bowl, and mom said there was just enough for seconds. I hated having to wait for my little brother to finish, but mom let me go get my costume on while she cleaned up my brother. After Trick-or-treating, the house still smelled like the pea soup, but I was too full of candy to want any more. Mom made us pour out the rest of our candy to see what we could keep, while I smirked at my secret of already eating several pieces until my stupid brother told her we ate some on the way home – and I had told him he could have some only if he didn’t tell mom when we got home. She told us to go straight to bed, adding that if we were poisoned it served us right for not listening to her, but when my brother burst into tears thinking he was going to die she relented and let us stay up another half-hour. Through the years, Halloween has held a special memory of my mom’s pea soup, but I’ve yet to have, or make, pea soup as good as hers. 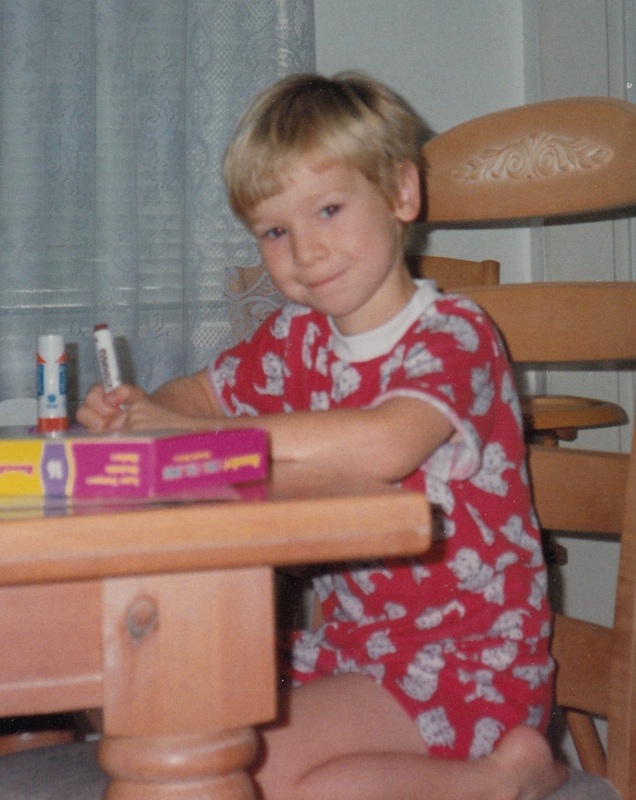 101 Dalmatian pajamas, 4T. I breathe into the fabric, trying to catch the scent of my little boy, but I forgot that I washed them before packing them away in the box of baby remembrances when he had outgrown them. The box also contained his cloth Madeleine doll, which showed where the scar was from her appendectomy, and the yellow rubber duck received at his baby shower that he had to have at every bath time. I say ‘contained’ because when his sister, my nearly step-daughter, had her first child four years ago, I sent the rubber duck, after sterilizing it, with a letter, saying that I hoped her daughter would like it, and if she remembered how her brother had loved it when he was a baby. His sister emailed me after she got the package, telling me how sweet that was, and her daughter liked it too. When we went to visit them a few years ago, it was gratifying to see the rubber duck in among the bathtub toy collection. She mentioned in a post how her daughter was enjoying the Madeleine books, and I knew it was time to send along the Madeleine doll, so beloved by my son at her daughter’s age, along with a little monkey puppet for her latest family addition, who is now a year old, and I haven’t yet met. I got a note the other day telling me they received the package, and her daughter asked if she could keep the doll forever. It seemed overly sentimental and silly to keep those few things from my son’s childhood, but I have no keepsakes, and no pictures from mine, so it was important to me, and I thought my son would one day appreciate the link back to his youth. He thought it was cool that I had sent his niece the Madeleine doll, and we spoke about how he used to watch the Madeleine cartoon, and have me read the books over and over. Rather than merely keeping useless things that only had meaning to me, the items became an heirloom of sorts, and re-connected my son and I with a happy memory from the past, as well as furthering my son and his sister’s bond, with her children too. Keeping sentimental things just adds to my pile of stuff, so I’ve done my best to pare down, taking pictures of things before giving them away or recycling them. Having some tactile link to the past is important to me though, so the 101 Dalmatian pajamas will remain in the (now smaller) keepsake box. I wish I were a child again – experiencing the night as I did all those years ago, the anticipation and fun. I wish I were a young mother again – getting my son ready for Halloween night, and how much fun it was to roam the neighborhood with other moms and their children, witnessing the excitement, and helping create the sense of magic about to happen. Spooky Halloween everyone! I hope you enjoy the day, and especially the night! Have fun and be safe. Cheers! On Hallowe’en, when I was around five or six (maybe even the same year I split my head open), my older siblings were allowed to leave on their own to go trick-or-treating, but I had to stay home until I finished my supper, and wait for my mom to get my little brother in his costume. I remember thinking how completely unfair it was that I had to wait for my baby brother, and be treated ‘like a baby’, when my next oldest sister was only two years older than me, and she got to go out with my other sister and brothers. After enough complaints, my mother warned me that she could leave me home while she brought my brother around if I kept harassing her. I don’t think I uttered a word after that until we finally went out into the chilly night. One of my deepest regrets is not getting to sing with Hans Sven Poulsen again after he visited the commune/cult and recorded “The Wonderchild Family” album with a group of us kids. Hans had invited me to come sing with him in a benefit he was going to do for the Children’s Hospital in Boston after he finished his recordings with us. I wasn’t able to get to Boston, and a few months later, Hans found out he had cancer and began treatment for that, eventually leaving for the West coast, and then back home to Australia. In June of 2000, my son and I went to Australia to meet and stay with my pen-pal whom I’d been writing to since I was twelve. I managed to track down Hans and got in touch with him so my son and I got to visit him and his wife in Melbourne a few days before our flight back to the U.S. He had suffered a stroke back in the 1990’s, but had done much to rehabilitate, and was again playing music and working as a music therapist. Perhaps everything unfolded perfectly, or maybe my desire wasn’t stronger than my fear, but I’ve always thought that if I had sung with him at the benefit concert I would have ‘been discovered’ or somehow made connections to start my singing career. If getting the life I wanted when I wanted it meant that I wouldn’t have had my son, then I’m less remorseful, and seeing as there is no way I can know that, I choose to believe that having my son was the best opportunity I took. We had split-pea soup that night, which was one of my favorite dishes my mom made, but there would be no seconds that night. I wanted to get out there and trick-or-treat until my pillowcase was filled to the brim with candy! I never stopped to think how heavy it would be to actually fill a pillowcase full of candy. Back then, there were no ‘fun-sized’ candy bars, only full-sized bars, but people often gave things like small boxes of raisins, or popcorn balls, or apples. My mom would usually throw out anything that wasn’t store-bought, so I had to beg her let me keep a candied-apple one year, and she finally acquiesced after I badgered her so much that she told me it would serve me right if I found a razor-blade in the apple. I also think I lied and told her I knew who it was who gave me the apple, so she could have them arrested if I died. All week before Hallowe’en I walked home from school singing the Five Little Pumpkins song, and felt a chill up my spine when I sang, “Oo, ooh went the wind, and out went the light…!” I would pull off any leaves still clinging to their branches that I could reach on my way home, as though that would hasten the arrival of the much-anticipated day. My older sisters and brothers always ended up with more candy than I, or my younger brother ever got, and I remember thinking that I couldn’t wait until I was old enough to get as much candy as them. When I was about five or six, my family moved into a two-story house heated by steam radiation. I used to try spinning on the twist knobs at the bottom of the cast iron radiators, and managed a three-quarter turn. I stopped my efforts at a full turn when I fell and got a black eye after hitting the knob. My older sisters and brothers used to scare me and my little brother around Hallowe’en by taunting us before bedtime with a ghostly sounding chant of: “There’s a bad guy in the window!”, starting low and soft and reaching a high crescendo after the third or fourth refrain, and we’d run screaming up to our rooms. A night or so before Hallowe’en that year, my brothers got the bright idea of cutting out a cardboard silhouette of a man, placing it in the upstairs window near my bedroom, and illuminating it with a flashlight behind the curtain. While the 'bad guy' in the window didn't look like this, this drawing I found is creepy enough to represent what it looked like to me. I got so scared when I saw it, especially because one of my sisters was chanting the ‘bad guy’ theme just before my brothers moved to reveal the cut-out, or somehow made sure I saw it. I ran screaming with my hands over my eyes and my head down, directly into one of the cast iron radiators. I cut the top of my head open so deep that my mother had to bring me to the hospital to get stitches. I remember that when we got to the hospital and they were cleaning the wound, the nurse told me that the doctor was going to sew me up, but if I needed him to stop, just tell her it hurt, and they’d stop. I was lying face down in a pillow, and yelled as loud as I could for them to stop because it hurt so much, but they didn’t listen. My only consolation was that it took three nurses to hold me still enough for the doctor to finish sewing up the wound. I was so mad at that nurse for tricking me. Being lied to about pain when I was a child led me to always tell my son that shots, or stitches, etc., would indeed hurt, but that I believed he could handle it, and it would be over as quickly as possible. Thankfully, there weren’t many times I needed to prepare him for pain. I’ve just woken up, and the smell of grass, flowers, and trees wafts in through the kitchen window as I heat water in the kettle on the stove for my coffee. I turn on the radio to hear, Summer Breeze, by Seals and Crofts, and smile at the moment’s synchronicity. Another breeze gently billows the kitchen window curtain and this time the scents carried in place me back to a summer morning when I was fifteen. I’d been woken up around five that morning by my friend, Steven, who urged me to get dressed quickly because he was taking me and his son somewhere. When I asked where he said: “Nevermind that, just hurry up!”. I pulled on my shorts and shirt, brushed my teeth, and ran out the door to his idling truck. His sleepy-eyed four year-old son smiled at me, and I grinned back as I slid into the seat beside him, and we were on our way. Steven would only say that we were headed up to Leyden, and that he wanted to show us something. We rode in silence for several miles, Steven’s son having fallen back asleep as we drove on. Steven finally broke the silence by announcing that we were almost there. We turned off the main road onto a dirt, tractor path, heading out toward a field ahead of us. It looked as though the path was not often used as a patch of thick grass grew in the rise between the tire ruts, and thin weeds spotted the tracks themselves. Steven drove his truck to a rise in a copse of trees and parked. He got out and motioned for us to do the same. Steven picked up his son as we got out of the truck, and I followed him to the edge of the trees overlooking another field where he stopped, telling us to crouch down and be very quiet. He began speaking in a loud whisper about a morning some months before when he and another friend had been camping at that very spot and witnessed a UFO rising from the field below into the sky early that next morning; the only sound they heard was a deep hum, as you might hear in an electrical plant. He continued telling us how he and his friend watched the massive disk-shaped craft rise straight up until it cleared the tree line, and then sped up in diagonal trajectory, gone from their sight within seconds. After some time in disbelief of what they had seen, and in fear that the craft might re-appear, they hesitantly made their way down into the field to find flattened grass, but no other trace that anything unusual had been there. I felt scared as we watched the field, but nothing happened. Steven brought us down into the field after waiting expectantly for what seemed like the better part of an hour, but nothing had been disturbed, and he was disappointed because he said he had a feeling that we might witness the UFO again. I gave him a look of sympathy, but inwardly felt relieved that nothing had happened while we were there. He took us out to breakfast before heading back home. Later, I told my friends Steven’s story, but they scoffed and said he was just messing with me. I laughed it off with them as a good practical joke, but knew that Steven had been quite sincere. I think about that morning from time to time and always feel special that he chose me to share it with. He must have known that out of anyone else he could have asked, I’d believe him. I hope to see an alien craft someday, but have no wish to meet alien beings – even if they’re harmless. I’ve seen too many movies that display the opposite qualities. Two Out Of Three Ain’t Bad, by, Meatloaf, is playing on a humid July night. I’m reading Pardon Me, You’re Stepping On My Eyeball, by Paul Zindel, on the hood of a friend’s Chevy Cavalier, waiting for a few of my other friends to show up and decide what we’re going to do with the rest of the night. It’s quiet on the Avenue, but I hear the strains of Meatloaf out of the jukebox coming from the bar next door, and I look up from my reading to watch the moths and other night bugs swirl around, looking like aberrant snowflakes in the street light above the car I’m perched on. My shorts and top cling to me in the sticky humidity, and I hope we decide to go swimming in the Green River, or at the Leyden Glen. We had been removed from there by police officers the week before, but they couldn’t be there all the time, so we took our chances going back on hot, humid nights. I had worked at, Zapmia Pizza (baby), earlier that evening, and was glad to be done with my shift on such a hot day. I was anxious to meet up with my friends, and hoped they would show up soon. Debbie was the first to arrive. I was so absorbed in my book that I didn’t notice her until she hopped up onto the car hood, causing it to buckle a little as she plunked down, but the hood popped back up as she shifted her weight toward the center next to me. We exchanged greetings and then chatted about the book for a few minutes, and finally other friends started arriving so we made our evening plans. I remembered this so strongly tonight that I could feel the night air around me as I did back then, and hear how the music sounded muffled until a patron went in or out of the bar and the music would blast out from the entrance for a few moments until the door was shut once again. While I don’t miss that time of my life, and especially what was happening to me, I dearly miss my friends and the closeness we shared. A part of my soul is back there with them – maybe it’s even trapped in some odd space/time continuum – or perhaps less trapped than enshrined. I get to visit the museum exhibit in my mind, but it’s an empty picture of the vibrant life that was actually there. They were the people who knew and understood me on a level that no one else will ever come close to, but they live on in my heart and soul, and I hope I live on in theirs.